Cinema arrived in 1895 and had reached almost every corner of the globe by the end of 1896. At the close of the nineteenth century it was firmly established as a medium of entertainment, instruction and experiment, making fortunes and reputations and changing the very way that people looked on their world. This website is a biographical guide to the world of Victorian film. It features 300 biographies of those who, behind and in front of the camera, played a significant part in creating the phenomenon of moving pictures. It is based on the book Who's Who of Victorian Cinema, published by the British Film Institute in 1996. 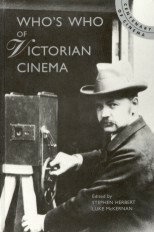 It has been revised throughout, and new entries and background features added, to make the website serve as a reference source to the world of Victorian film and the world as seen through the eyes of the Victorian filmmakers. Victorian film we define as filmmaking in its broadest sense, from the first glimmerings in the 1870s and 80s to the death of Queen Victoria in January 1901. The confusion that existed at the birth of film to a very large extent still exists. Moving pictures did not arrive as a neat package on a specific date; those who were involved knew nothing of the phenomenon of cinema that was to come. They were scientists who saw film as an aid to their work, businessmen who hoped to exploit a new invention for the short period they expected the public to be attracted to it, or performers only doing what they would normally do on a stage. Moving pictures were just another invention in an age of inventions, or just another variety turn. What none could have foreseen was the grip that film would have on audiences, how the medium would develop and extend itself, and how the moving image would become dominant as a means of communication and entertainment in the twentieth and twenty-first centuries. More than one hundred years on, the birth of film retains an obvious fascination, but is a subject riven with rivalries (national, personal and technical) and controversies. Who invented the cinema? No-one is the sensible answer, though this debate that arose just as soon as the cinema had become established has raged ever since and continues to do so today. What this website tries to do is to show something of the lives of the many hundreds of people worldwide who by their efforts in the closing years of the nineteenth century collectively invented the cinema. Scientists, entrepreneurs, doctors, sportsmen, artists, politicians, dancers, photographers, reporters, showmen, propagandists and crooks: the whole extraordinary variousness of the late Victorian era. Many of the names included here went on to flourish in the later cinema world, and these later lives are documented. Many more slipped back into obscurity; these have been described as best as can be done from the few sources that remain. It has been necessary to be selective, so this website is a Who's Who and not a comprehensive biographical dictionary for the period. An international balance has been maintained, and it has been important to include not only those who made the films or acted for them, but public figures whose appearance on film helped establish its form and popularity. The website also covers the major figures of the pre-cinema period whose work in sequence photography or screen projection most clearly pointed the way to cinema. Many names have had to be left out chiefly through a lack of substantial information. It is extraordinary how little is known about so many of the Victorian filmmakers; often it consists of no more than a patent application or a few references to their activities in contemporary journals. Much information lies scattered, often in specialised journals or in works that remain unknown outside their country of origin. It was frustration at trying to piece together information on individuals from this period from a variety of sources, that led to the compiling of the original book version of this website in 1996. Twenty-seven contributors have been generous in their expertise to help produce what is hopefully an authoritative, international reference work. We hope that Who's Who of Victorian Cinema will serve both as a reference source to those familiar with this specialised area of early film history, and as an approachable guide for those with a general interest in the late Victorian era, the development of modern technologies, the rise of communications, mass media, the music hall and variety theatre, or simply those interested in people from the past. We welcome any comments, corrections or suggestions for new material (see Contact us page). This was a marvellous period in human creativity; we hope that you enjoy making your own discoveries through the world of Victorian cinema.